When I say desk... 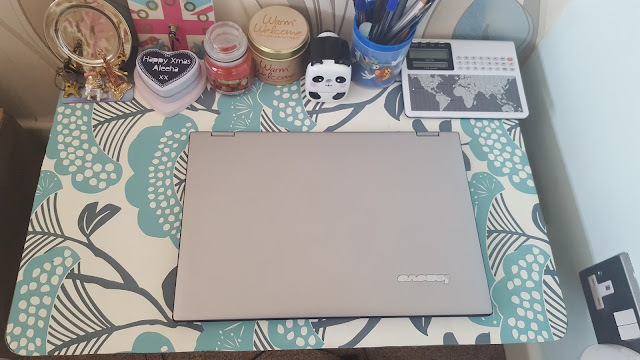 I mean a mini fold-able desk that I use for decoration and to take blog pictures on. 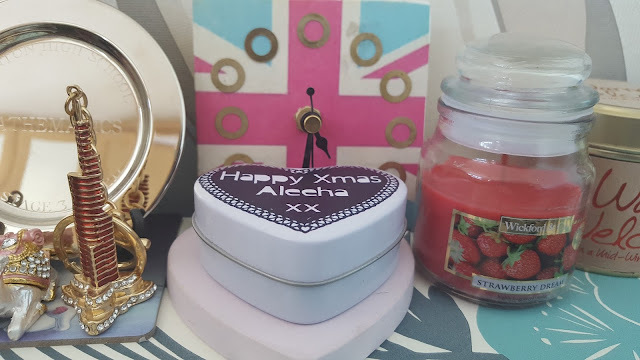 Anyway, I have quite a few random bits and pieces on my 'desk' and since that's where I take my blog pictures I thought it would be appropriate to show you what some of that stuff is! I actually covered the desk in wallpaper! I went for a blue and white floral wallpaper to match my room. 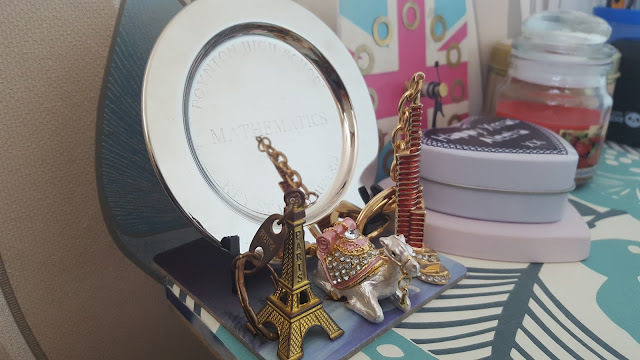 I have a little snowman coaster (which is just one of the ones you get for free in the post) and I've put my maths award from school there (I sound like such a nerd...). I also keep a little mini Eiffel tower, a camel and mini Burj Khalifa on there. The next thing is a clock that I made at school and I'm actually quite proud of it! I've got a pink heart thing that I keep a candle on which I got from Lucy for Christmas. It's a really lovely fresh scent that's perfect for Spring! Then there's another 2 candles! The first one is more of a summery scent and the other one is a more musky vanilla, winter scent. Yeah... 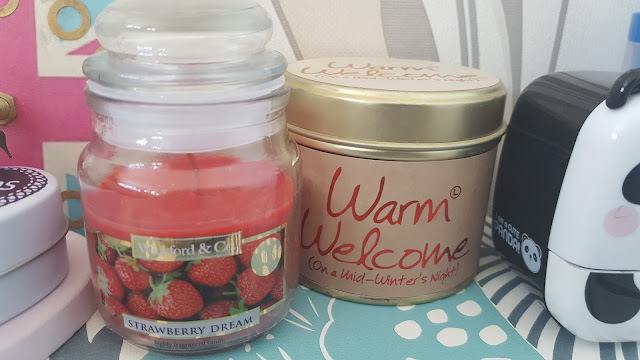 I err like to keep candles out for each season, I just need to find one that I love for Autumn! Next is this adorable panda sharpener from Tesco and I just thought it was too cute not to show. 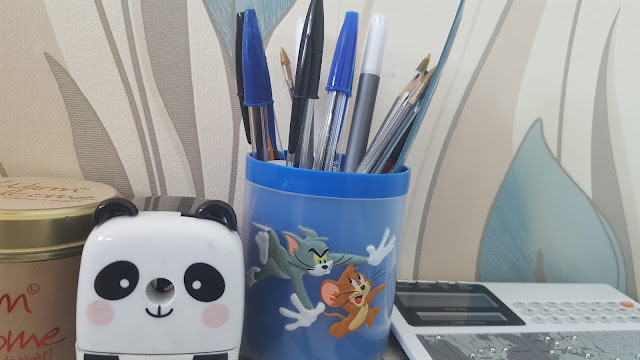 I also have this Tom & Jerry pot that I like to put pens and pencils in. 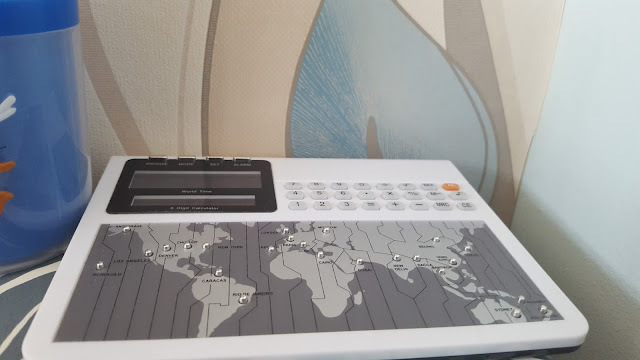 The last thing on my desk is a world clock, alarm and calculator thing... that doesn't actually work because I've not put batteries in, but it looks cool so I've put it there anyway! 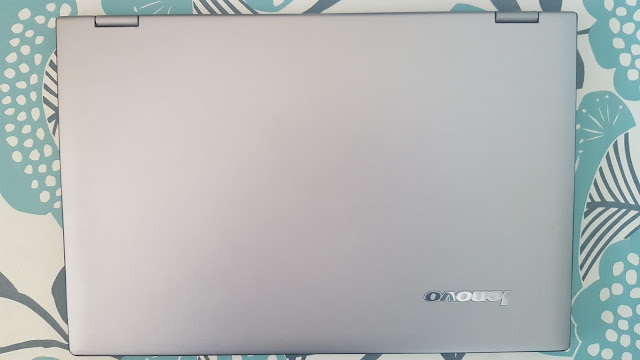 The last thing I keep on my desk is my laptop. I also usually keep my phone next to it, mainly just because the plug socket is right next to my desk! Where do you like to take blog pictures?